PETITE BROWN SUGAR: Ripped jeans! For the last few weeks I can see that ripped jeans are back on trend! 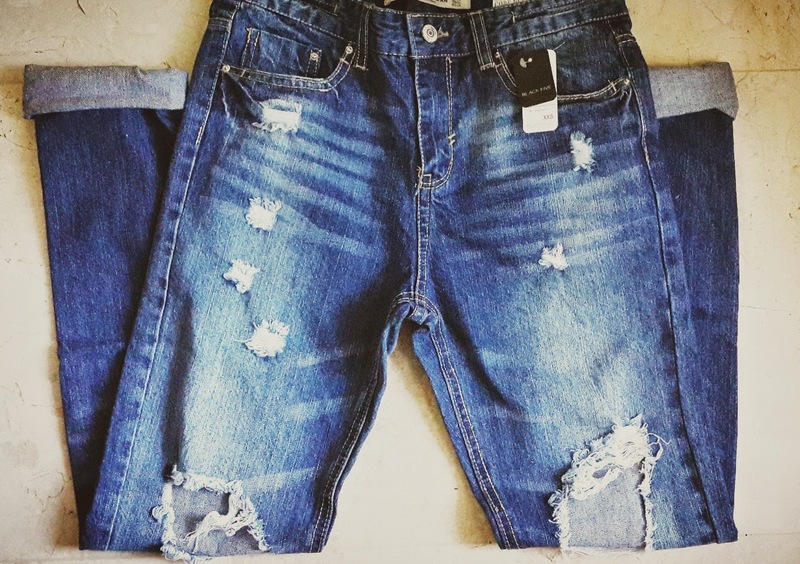 Many fashion lovers rocks their fave ripped jeans with their comfy tees, jackets and shoes. During my pregnancy, it is not easy to mix and match my regular casual clothes … esp. my ripped jeans! You know, it's a bit uncomfortable to wear jeans during pregnancy because it's so tight. But, I found a way, so I can still look pretty stylish even tough I have a baby bump… hihi! BlackFive is one of the authorities on global women's fashion clothing, is an online destination for it girls around the world. They sell cutting-edge 'fast fashion' as well as a wide variety of fashion-related items. In a word, BlackFive is all about fashion. Their concept is latest fashion at the best prices. Their mission is to be the best at serving you, their customer. Their customers are their daily inspiration and they strive to serve them in ways never imagined. Their approach is: always serve, always build, always long term, always the beginning. Stripey coat from La Delle Cloth, Ripped jeans from Blackfive.com, flatform by Zara. I think it's my very first look for my blog during my pregnancy… haha! You can see my huge baby bump! and also my darker skin… yess, my skin getting darker and darker during my pregnancy… many people said it is because I am having a baby boy, so I look uglier. Haha! Feel free to leave a comment and questions! Nice look, love the striped jacket and the ripped jeans! And the ripped boyfriend jeans are my latest obsession! look so comfy. Love the ripped jeans and flatform. what a wonderful you are! I love love love your outfit and style! Love your flatform sandals! Look amazing with the ripped jeans.